Take your brand to the next level with our custom mobile boutiques. Get your company noticed on-the-go by adding full coverage graphics to your truck, trailer, car or bus. Blow away the competition with one of a kind blow up structures. These structures are a fun and unique way to promote your new product or to host an event in. 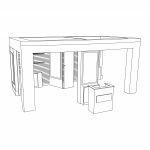 Rustic meets chic with one of the most economical and convenient pop up structures available today. Shipping container modules can be custom designed to fit your needs; ideal for housing, retail space, restaurant space, office space, medical space or even green houses! Our design team will help you come up with a creative look and feel for the interior and/or exterior of your pop-up store. Imagine a structure that is an exact replica of your best product. We can make it happen with our custom modular systems. These structures are guaranteed to get attention and to make a statement.